It was good for me to return to this book, ten to fifteen years since I read it last. I think, on reflection, while I loved the story then, a lot went over my head. Which is a bit surprising since Tepper isn't exactly subtle in this book... Not all science fiction is political, but you can count on examinations of politics, morality, and gender in Tepper's works. This does end up with some instances of archetypes rather than characters, but she makes it work well, in part by using an archetype with depth that other characters to reflect off of. Some of the mystery is lost in a re-read, but there were still enough details that I missed or forgot that I hunted for clues throughout. I throughly enjoyed my reread, and plan on hitting up the other two Arabi books in the near future. At almost 20 years old, Grass does not suffer from anachronisms, neatly sidestepping how society and technology has changed between 1989 and now. The Noldor, strong and numerous, fair well in their alliance with Men. For about five hundred years at least. Time gets a bit wonky when dealing with the conniving of immortals, and "patience" becomes a bit relative. I can't even say that Morgoth was really patient by waiting five hundred years because he built up his resources until he reached "good enough," and rushes out to burninate the countryside without really evaluating his plan. And behold, Elves discover Men. Or more specifically, an Eldar discovers Men, because they already associated with the Dark Elves. We've covered a basic summary of Men in this story in Chapter 13, but it lacks depth or a clear sense of timeline. Finrod Felagund, lord of Nargothrond stumbles across a camp of Men under the leadership of one Bëor (really named Balan, but I guess the Elven name wins out) by chance and becomes rather fascinated by them. After they fall asleep he steals into the camp, and they awake to the sound of an elf singing and playing with such skill that they had yet to encounter. They at first take him for one of the Valar, but he stays among them and imparts knowledge, forging a bond between these Men and his line. Actually, I have two December Reads. The first one is We by Yevgeny Zamyatin, the other is The Hogfather by Terry Pratchett. A bit of a spread, I know. I learned about We when a local book club ordered copies last year. I had never heard of this Russian dystopian novel from the 1920's, and I was fascinated by the description. It's a small book, but I hope it proves a worthwhile read, and small books are good for the end of the year when everything comes to a head. So that's my Virtual Speculation pick. The Hogfather on the other hand, is a delightful re-read, that I'm diving into with a group of others as a holiday buddy read. It's one of my favorite Discworld novels, and I actually really enjoy the movie. I'm not sure how much I'll be posting mid-read, though that seems to be a big part of buddy reads. The problem is, I'll want to post 70% of the book. So be it, right? I suppose it's semi-redundant to say any particular chapter exists to introduce characters and set the stage, as we're reading a "history" text... but this chapter introduces us to characters and sets the stage. The really short summary is the daughter of Fingolfin goes on walkabout, gets ensnared in a marriage, has a kid, then goes back home, sacrifices herself to keep her kid alive, and her kid brings glory to the Noldor while slowly becoming consumed with envy and anger. A summary of this chapter could be "the sins of the fathers come to haunt the sons." The elves as a whole prosper, but the Noldor suffer from their alienation of he Valar and their infringement on the established elven societies. The Doom of Mandos hangs over them, the threat of treason from within, rather like the Sword of Damocles. Adding to comparisons, Melian is Thingol's Cassandra, who seems to get the "don't worry your pretty head" treatment quite a bit for some reason. This weekend, we lived a Gothic Horror/Romance. With space wizards and light sabers. On a real life heavy cruiser. I did horrible things to amazing people, causing characters emotional trauma and player tears. I lost track of the number of times friends told me they hated me or that I was the worst as they gleefully went deeper into the dark places of the plot. 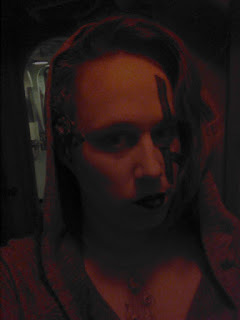 Not only that, I portrayed a space wizard ghost trapped in a ship and who thinks its the AI. Sometimes, life is pretty sweet. I also admit that I'm a strange person. When I was invited to contribute to Legends of the Stars 2 (website, Facebook), I think I had a bit of a brain glitch. Really? They wanted me to contribute? Holy crap. We'll hand wave the ensuing anxiety of whether or not it was a true invite that lasted through my first story development meeting up until I was officially on the writing team. This made for one of my top LARP experiences so far. I'm still buzzing from it. I'm keeping this one short and sweet, in part because this is the type of chapter that is very hard for me to read. In short, Of Beleriand and it's Realms is a narrative description of a map and the prominent names attached. It would make a rather lovely graphic, the map with tags for the different areas and the data sectioned accordingly. Actually, I'm pretty sure I've seen it as such, but life has me a bit swamped, so I'm cheating on this one, and moving on. No one writes quite like Squailia. I met her when we were both on a panel about body horror, and shortly afterwards looked up her book, Dead Boys. It was strange, creepy, creative, and wonderful. So that brought me to eagerly looking forward to reading Viscera, and it seemed like a good choice for an October read, so here we are. Viscera is dark, funny, weird, creepy, unexpected, and human. I also see a lot of what Squailia talked about in the panel, particularly at looking at gender dysmorphia in the framing of body horror. Excellent novel that I could not put down. Somehow I got myself involved in writing for four LARP events going off this month, including the MES North East Regional Showcase and Legend of the Stars, Run 2. It's made things a bit interesting around here. I also wrote another Escape Room and ran it at my library, and am running a rework of the one I ran this summer at another library. And the 14th sees Elizabeth Bear and Scott Lynch visiting my library for an author event I organized. And at the start of the new Age, the Valar rested. We've got a bit of a pattern here, but on the other hand, we have the equivalent of children or teenagers running the planet. Immortality, powers of creation, and honestly little to do but entertain themselves besides the occasional scurry to pick up all the dirty socks off the floor does not do a whole lot for developing a work ethic or a sense of responsibility. So with little notice or fanfare, the Younger Children of Iluvatar awake in Middle Earth. The Elves greeted Men like an unwanted sibling, and the Valar are the absent parent. The metaphor isn't perfect, but it's close enough. This was the September book club pick. The first thing that struck me was that the writing was far more lyrical than I expected. The narrative twines through the city and an examination of writing itself, while experiencing almost a dissociation from time and the main character itself. It's definitely a book I think my enjoyment of depends a lot on my state of mind, as does what I take away from it. I'm truly not sure what I think of it. What is happening in this story?How does author talk about race, gender, and sexuality?Do the decades since publication change the impact and context of the book?How does Delany make use of (or subvert) literary traditions and narrative cycles? The trees have fallen and the Silmarils lost. Teleperion bears one last flower of silver, and Laurelin a single fruit of gold, which were taken and put into vessels to hang in the sky as great lamps. With these lamps they resolve to illuminate Middle Earth, bringing light to the people's there and hindering Melkor's (literally) dark deeds. Good news: the Valar have a solid idea that they need to actually pay attention to Melkor and the danger he poses. Bad news: with the arrival of humans imminent (plus the waking of the dwarves), waging war on Melkor might take out the life they're charged with preparing the world for. We change gears for a bit, looking at the Sindar, those that started the "Great Journey," but who stayed in Beleriand instead of crossing the ocean. After all, there's more than just Valinor. I have to assume if you're reading The Silmarillion you're at least vaguely familiar with The Lord of the Rings and The Hobbit. But if you aren't, I hope that the fact that Tolkien makes specific mention of the birth of Lúthien stands out. Spoiler, she's kind of a big deal, and not just because she's the daughter of the Maiar Melian and the Elven King Thingol. The Christmas season has come to London, along with a new moon, and there are things that take advantage of the dark of night (reviewer aside - why Christmas Eve and not Solstice?). Among all the gifts and cheer, a Book finds its way into the hands of a resentful young man who desires power. What starts as a sacrifice and invocation, soon proves dark and alien, to a dangerous end. Sometimes I put a book on my book club list because I desperately want to read it but other books keep getting in the way. Yes, this is a problem in my life. I discovered Gabriel Squallia when we were co-panelists for Lovecraftian Intimacy: Body Horror & Mind Melds at Arisia 2016. Long story short, I found Squallia inventive and fascinating, descriptions which I would both apply to their first novel, Dead Boys. Viscera promises fantasy, horror, comedy, wit, and wonders. Sounds like a good October read to me. Sometimes I'll pick a book up just for it's title or it's cover. If it's a cookbook we're talking about with the promise of gratuitous puns, well, I'm pretty sold. The book delivers on promised tone and puns both, fun, snarky, and well explained. The recipes veer into the unexpected, with the inclusion of various snack foods such as Doritos and Hot Cheetos as part of the flavor, texture, or highlight of sweet treats. But even if you're conservative when it comes to flavor combinations, there's plenty for you here, and a number of recipes you can make a more traditional version of by simply sidestepping the inclusion of the salty munchie in question. A fun addition to your cookbook collection, and if you're in a library one I think that will definitely circulate on amusement value alone. During this time Fëanor creates his Masterwork, the Silmarils, in which he captures the light of the Trees. Varda imbued the rings "so that thereafter no mortal flesh, nor hands unclean, nor anything of evil might touch them," (which leaves me wondering how the Silmarils and the quasi-mortal half-Elves would interact) and Mandows foretold that the very fates of Middle Earth lay within them. Rat Queens Deluxe Hardcover Volume 1 (contains Volumes 1 & 2)Rat Queens Volume 3: Demons This is undoubtedly the Rat Queens I've come to love, but there's a lot missing and I don't know where it went. It's not just the missing story between the end of Volume 3 and the beginning of Volume 4 that's jarring and confusing, no matter how happy I am to see Hannah back in the heart of things. Even with an overarching plotline, Volume 4 reads like a series of vignettes rather than cohesive story. There are pieces missing, and some of those pieces belong to the very heart of the story. Things start out quite nicely, with Melkor locked away, the Eldar gathering and enjoying a time of peace. We even have a love story. Spoiler: it all ends horribly. As soon as I read that Míriel could only stand to bear a single child and that Finwë wanted more my first thought was "Well, this is going to end poorly." A Canticle for Leibowitz / Walter M. Miller, Jr. The back of my copy in hand lists an excerpt from The New York Times review, "Angry, eloquent... a terrific story." I can't disagree with that. A Canticle for Leibowitz is bleak assessment of humanity in a continual cycle of self-destruction and struggle for survival, with strong themes on information literacy, morality, and anti-intellectualism. I think I would have been far happier reading it... maybe last year. However, it is definitely worth reading and I'm glad I got to it. This week, a picture says a thousand words. The divisions between the Elves partially came down to luck, which I have various grumbly feelings about. That those who were too far away to hear Ulmo's summons are a sub-classification in terms of Elven standing and lore is a bit snobbish. Especially since the Valar could have reunited the groups much earlier than they did. Somehow Samuel R. Delany managed to stay under my radar for most of my life. Reading about him and his works, I feel like the fact that I have yet to read any thing by him is absurd. Considering the significance of the moment covered by this chapter and Tolkien's treatment of epic love stories, this chapter stands out as shockingly short. Elwë (referred to in the chapter title as Thingol), an was one of the elves to visit Valinor then come back to their people to offer the choice of haven in the Light of the Trees. And then he comes across the Maia Melian, and that whole plan of residing in Valinor goes out the window. We've met the Maia before, the name Gandalf probably rings a bell. Melian brought song to the twilight of Middle Earth. Beyond inspiring Elwë to abandon the life he convinced what would become a whole subset of his own race to follow, they are the first couple in a lineage of epic love stories that transcend race. Melian births Lúthien Tinúviel, of Elven song and lore and her marriage to Beren. The line continues through to Elrond, and then to Arwen who marries Aragon in her own repeat of the trials of Lúthien and Beren. Most of Toby's stories drop you into the action and feed you necessary bits of exposition as they barrel along. This book takes the time to introduce you to the world setting, and in that marks a note of gravity and weight that has been absent at the start of the stories, but has always lain lurking. In that, the novel starts off feeling like we've reached a new step, gone past some point of no return in both Toby's life and in Faerie itself. Fitting, since ina the author's own words, Toby is starting to pay off debts created five or six books ago. Wherein the Valar largely avoid doing their job, let things get bad, then scramble to make up for it. "Through long ages the Valar dwelt in bliss in the light of the Trees beyond the Mountains of Aman, but all Middle-earth lay in a twilight under the stars." Dwelling in their own private Haven is really not what they were sent to the world to do. Yavanna moped about, but at least did what she could to protect the life that couldn't grow under the twilight. Besides that...well, Melkor certainly took advantage of the situation, digging in and fortifying his position. Most notably we learn about his fortress, Angband, commanded by his lieutenant, Sauron. Valanar to me seems almost a Garden of Eden, but Ilúvatar proves rather more benevolent than Yahweh. Rather than a forbidden fruit from the tree of knowledge we have the creation of life. Which by Christian standards and morals strikes me like the larger transgression. So Aulë so desired Children to pass on his knowledge to that he formed the Dwarves, and Ilúvatar shows compassion in the face of Aulë's demonstrated humility, awarding the Dwarves a place in the world. Even if that place comes after a long hibernation so that the Elves can still be the First. I guess the crime in Eden could be considered Pride, a sin Aulë debased himself against. In the early days, while the world was still being formed, a powerful spirit came to the aid of the Valar against Melkor, driving him off with his "wrath and laughter." And thus did Tulkas the Strong come to reside among he Valar and become one of their number. It also earned him the life-long enmity of Melkor, but let's be honest if you can face down Melkor, earning his enmity isn't exactly a huge surprise or challenge. Melkor's retreat to regroup and fortify gives everyone else some breathing room, and the Valar take it as an opportunity to tend to the world and bring life and beauty to it. Two mightly lamps are built, blessed, and set to the North and South (Illuin and Ormal), spreading light across the land. I really wanted to do some Atwood, and while much of what she writes is regular literary fiction, some of it does fit within SF/F, or general Speculative Fiction. I made a deliberate choice not to do The Handmaid's Tale (instead choosing The Core of the Sun), and I didn't really feel like re-reading Oryx and Crake, or using the second book in the series as a book club pick. So, I stumbled across The Blind Assassin which teased of a historical fiction with a science fiction story intertwined. So there we go, a June read. Yeah, I'm writing the review in August. It took me a bit to get through this one. In which the Elves (Eldar) tell us about the Valar and Maiar. Remember last week when I paraphrased a Bible verse? Well, we get some Book of Genesis here. In the beginning... Iluvatar created the Ainur, who made his Music and set forth to fulfill the visions of Earth and Iluvatar's beings within. Which, we've already covered, so let's keep going into the nitty gritty of pantheons and numerology. Or at least lightly brush up against them. Waiting for this one to come in via ILL. I went back and forth on whether or not to include this one. Some descriptions sound amazing, others I shy away from. Now that I'm about to dive in and flipping through some more detailed summaries, I'm pretty sure this is a book I need to read, and not just because it's considered a seminal piece of speculative fiction. My worry now is that it won't live up to my expectations. The book starts out hundreds of years after a nuclear war, the fall out of which was beyond the immediate cost of life, nuclear contamination, and environmental destruction, but extended to a rejection of intellectual growth and invention. Leibowitz smuggles, archives, and protects what he can, and the basis of his work later becomes a monastic order, and even further in the future we see it in the face of another nuclear war. July has proven to be a horrible month for me, so I went for a light read as the Virtual Speculation pick. Old Man's War is a light military SF read, written in a similar tradition of Starship Troopers, but it also manages to act as both a tribute and satire. In general I enjoy Scalzi's work. Fun, light reads, and he's proven to be a pretty good person as well. This is the second Scalzi read I've done, the first being Lock-In (which I've still failed to post an actual review of). 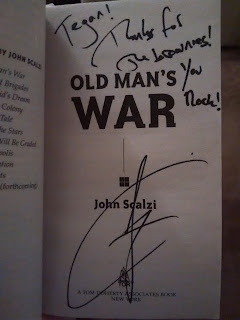 I've also met Scalzi several times, the last time being several months ago where, as the inscription on my copy of Old Man's War indicates, I brought brownies to the author event. In case you were wondering, it was a giant star brownie. Sadly, I was trying a new recipe for making them from scratch, and it was not my best baking result. (Sorry, John). In the beginning was the Song, and the Song was with Ilúvatar, and the Song was Illúvatar. Please forgive me the paraphrasing, and regardless of my atheist status, no disrespect is intended. The thing is, I cannot read Ainulindalë without thinking of the Bible. This is going to sound super weird, but I used to read the Bible in church because I was bored out of my mind during the sermon. Plus one of my college English classes did some readings so I have an Oxford Study Bible living on my shelves with all my folklore, religion, and mythology texts. I find study of religion, myths, and folklore fascinating, and I don't separate out popular modern religion from those of days past. On a whim (and due to a complete implosion of plans for D&D today), I ended up catching Valerian, which timed nicely with the fact that I borrowed Valerian, Vol 1: The New Future Trilogy from my library to read. Right off the bat I have to say the movie is utterly gorgeous. Absolutely breathtaking, with moments of travel that I think if I watched in 3D or IMAX I'd end up trying to fall out of my chair. Some of the aesthetics and feel look like the work of the Wachowskis. Overall, a fun, consistent story, if a bit heavy on the romance. Though I'm forced to ignore the implications of all the structural damage inflicted.